The internet provides plenty of opportunities to earn money online. Today, we’ve shared some good apps, with which you can always keep your phone balance in two or three digits by performing simple tasks. Hey, don’t worry! You don’t have to waste your precious time for this. The tasks are so easy that you can easily complete them in one or two minutes. All you have to do is use the apps for a few minutes in your leisure time. Immediate balance: When you are free, open the recharge apps and complete one or two tasks. 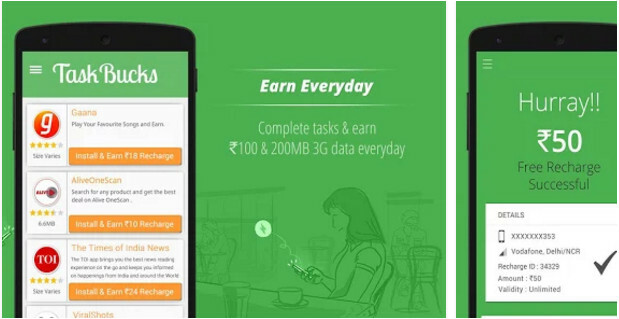 The app features a wallet module which gets updated with points aka recharge amount each time you finish a task. When your phone is running low on balance, you can easily recharge your mobile with the wallet balance. You don’t have to use your debit or credit card to recharge your phone number. Good alternative to loan amount: Most telecom operators allows users to get emergency balance by dialing a special USSD number. Frankly speaking, not everyone remembers the USSD code. During an emergency situation, you can quickly recharge your phone with the balance you’ve earned with the free mobile recharge apps instead of dialing the USSD number. Here’s the list of best phone recharge apps for your mobile device. 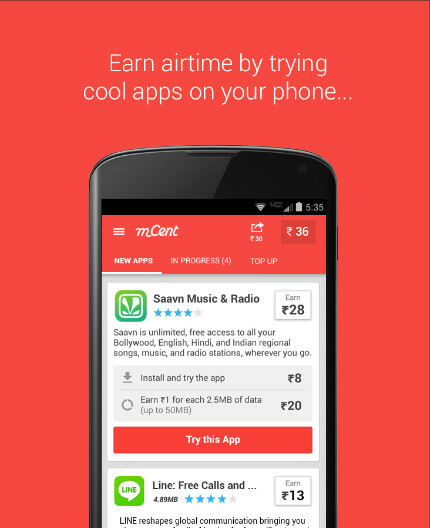 MCent is the most download app on our list. The app doesn’t have fake offers. It has an awesome rating of 4.1 on the Google Play Store. The ratings prove that MCent provides ample of opportunities to earn free recharge. MCent displays the list of available offers on its main interface. You must tap on the offer you find interesting. If you do so, the application shows instructions on how to get free recharge for the selected offer. Once you complete a task, MCent will refresh your balance. MCent app is easy to use. You can earn up to 500 INR every week with the free mobile recharge apps. True Balance is the first app from Balance Hero. It provides Rs 10 free recharge to every user that sign up for True Balance. It supports eight local Indian languages and has a stunning interface. 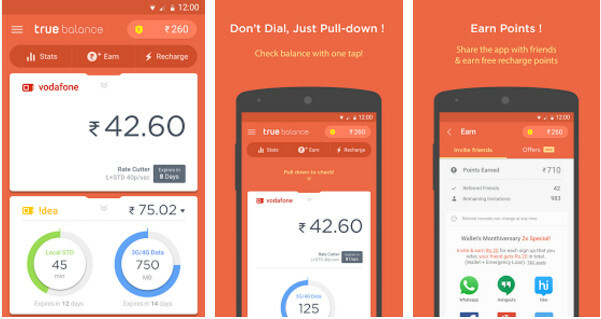 Apart from making users earn recharge, the True Balance app makes users aware of their prepaid balance. To get balance and validity details, the application dials USSD code on your phone at regular intervals. The app is highly recommended to the people who want to earn free mobile recharge and want to keep themselves updated about the prepaid balance and validity. To earn rewards/free recharge with the True Balance app, visit the Earn section of the app and tap on the offers option. Complete the task you see on the screen. Apart from downloading apps, you can earn free recharge with True Balance by inviting friends to download True Balance with a special URL. Once you install and run Slide Earn, you’ll be prompted to register a free account. Unlike other free recharge apps we’ve covered here, the app asks you to register an account with email address and also prompts you to enter the name, gender, age, and location. After you verify the account, log into the app. Now, you’ll see a grid interface that boasts several categories. You must select categories of your interests. Slide Earn shows a list of apps belonging to the categories you’ve opted for. You must download the recommended applications to earn free recharge. Ladoo enables you to earn loads of PayTM or PayPal cash by completing simple tasks. The app will begin to show tasks as soon as you install and run it. Ladoo app is available for users across six countries. Once you’ve earned enough points, you can redeem the points for free DTH or mobile recharge. The app has 10+ million users. Offers it displays are genuine. FreeATM is an app which pays 20 INR for first-time users. 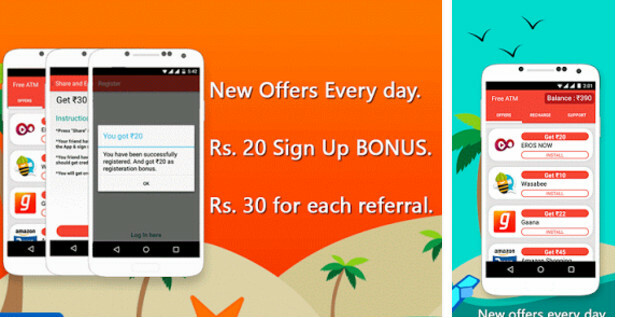 If you invite your friends and the friends register their account with this app, you’ll earn Rs 30 per referral. FreeATM covers new offers every day. It has a simple user interface. It supports postpaid, prepaid, and DTH recharge. FreeATM is a small app and it lets you recharge other phone numbers. Task Bucks is one of the most popular apps for earning free recharge. It has many offers aka tasks. The app rewards you with a point each time you follow the instruction it displays. The app lets you discover new websites and top applications. Task Bucks enables you to transfer the money you’ve earned with it to your MobiKwik or PayTM wallet app. Apart from a massive collection of various offers, the app lets you earn extra cash if you participate in the daily Task Buck contest. To win the cash, you must emerge as a winner. 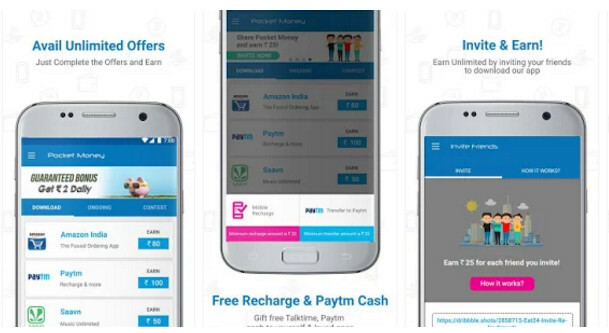 According to its official listing on the Play Store, users can earn up to Rs 3000 recharge amount every month with the Pocket Money app. The app asks you to complete simple tasks which include finishing surveys, downloading apps, watching videos, etc. The amount earned with the Pocket Money app can be either redeemed as a prepaid recharge or a DTH recharge. 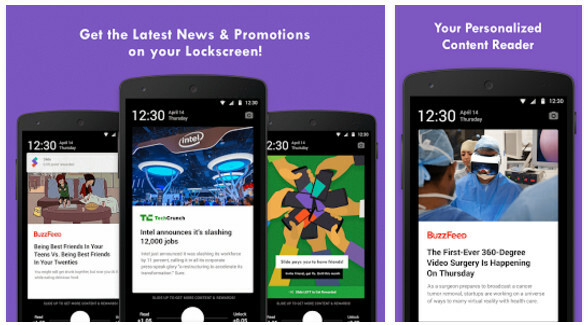 The app keeps you updated with new and exciting offers through the Android notification system. With this app, you can easily earn up to 60 Rs for every friend you refer. The app allows you to recharge a phone number once your balance reaches up to 10. The application comes with special weekly contests. If you participate and win the contest, you’ll be rewarded with a special gift hamper. Conclusion: The above apps provide a brilliant opportunity to earn free mobile recharge online. They are free to download. If you use the applications on regular basis, you will save 100 to 1000 Rs every month. What are you waiting for?